After nearly 2 years of developing, concocting and reworking, and perfecting we are finally very happy to announce the launch of our new Burks Traditional Scottish Shortbread inspired from many years of cooking with my grandmother. As a young boy, I remember always hanging around the kitchen and watching my grandmother bake. All the yummy things that came out of her kitchen were always so perfectly baked and made with love. She taught me at an early age that to make quality finished product’s it was important to produce using only the finest ingredients. Living in Vermont, makes this a necessity and only confirms my grandmother’s belief. 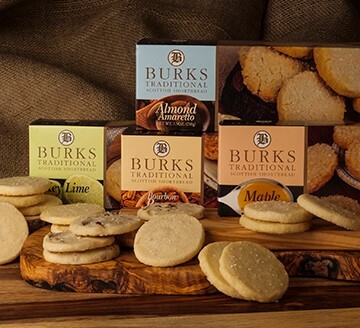 Our shortbread has been developed by two classically trained chefs who believe ” flavor and balance matter”. To do this one really needs to understand how the components work. We spent hours and hours analyzing how to produce the most tender cookie while making sure that the flavor and the cookie were the best they could be.